Ryan Rosburg (44) was one of four Missouri frontcourt players who combined for 32 points on 15-of-16 shooting, 15 rebounds and seven blocked shots in 74 minutes. Before Saturday, Keanau Post’s first season with the Missouri basketball program resembled an episode of "Finding Bigfoot." There were several unconfirmed sightings. Some noises in the woods. Occasionally, even blurry video footage surfaced that was thought to be that of the 6-foot-11 junior center who was a second-team junior college All-American a season ago at Southwestern Illinois College. 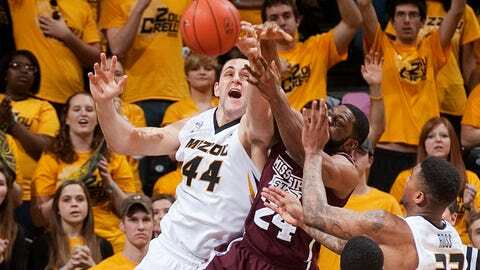 But that all changed Saturday as Post came off the bench to make an impact in Mizzou’s 85-66 victory against visiting Mississippi State at Mizzou Arena. "I think folks got a chance the last couple games or this game to see his skill set," Missouri coach Frank Haith told the Mizzou Network. "We’ve seen that. It’s just him being confident with what he’s doing and he’s been coming. His practices have been better and better in terms of him just believing in himself." Playing a career-high 22 minutes, Post scored 14 points and grabbed seven rebounds — both career bests — and added one blocked shot. "The last few games I have been playing well, and I think it is just a build-up from that," Post told reporters. "Our guards did a great job moving the ball and passing, so you have to give them a lot of credit for that." Post and his frontcourt friends — starters Ryan Rosburg and Johnathan Williams III and reserve Torren Jones — were in rare form Saturday. Those four players combined for 32 points on 15-of-16 shooting, 15 rebounds and seven blocked shots in 74 minutes. "Our post guys were tremendous," Haith said. "They were 15 of 16 from the floor, including J-III and Ryan, who have done most of the production all year. But how about Torren Jones and Keanau Post and what they did? They were in there activity-wise in terms of blocking shots and getting rebounds and coming up with some steals, too." That suddenly fearsome foursome helped the Tigers shoot a season-best 62.3 percent from the field. That mark is the team’s second best since the start of the 2011-12 season, a span of 98 games. Mizzou also recorded a season-high 19 assists, with seven from Jordan Clarkson, six from Wes Clark and five from Jabari Brown, who led all scorers with 21 points. 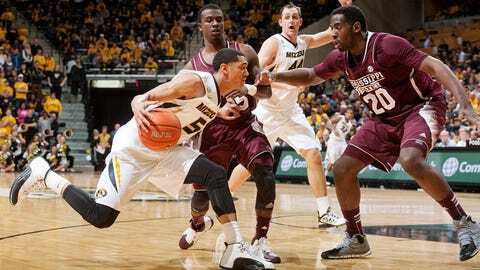 The guards found Post and his fellow posts inside time and time again and the Mizzou big men finished. "Keanau has definitely been working hard in practice, as well as the rest of the big men," Brown told reporters. "Just having them play how they played tonight consistently is allowing them to get better and more production. That just helps me, Jordan, E.J. (Earnest Ross) and Wes out there." If we get that kind of production out of our post guys with the way our perimeter players play, it makes us a pretty good ballclub. This was a much-needed victory for Missouri, which registered its sixth straight 20-win season and is now 20-9 overall and 8-8 in the Southeastern Conference. The Tigers had lost two in a row, on the road against Alabama and Georgia, and their hopes of making a sixth straight NCAA tournament appearance had taken a big hit. This was not a good Mississippi State squad (13-16 overall, 3-13 SEC) that traveled to Columbia. A home loss against the Bulldogs — who have now lost 11 in a row and were playing without their leading scorer — might have been enough for the tournament selection committee to slip Mizzou’s tourney resume through a paper shredder. So this outcome and the post production on this day must be met with a high degree of skepticism, but it was a good step forward for the Tigers’ collection of post players who have struggled to produce consistently. Those four players entered Saturday’s game contributing 12.6 points and 13.5 rebounds, on average, in Missouri’s first 28 games. Post and Jones, a 6-8 freshman, had played in only 23 of 28 games. Post entered Saturday’s game averaging 0.8 points and 1.3 rebounds per contest, with a career high of six points against Hawaii on Nov. 16 and a high of six rebounds against Auburn on Jan. 11. He had played sparingly, averaging just 6.7 minutes per game. The British Columbia native had played a total of 11 minutes in the losses at Alabama and Georgia and had zero points and two rebounds. So Saturday’s breakthrough performance — for Post and his frontcourt friends — comes at a perfect time for the Tigers. They have two games remaining in the regular season, against Texas A&M at home and at Tennessee, before the start of the SEC tournament. Mizzou needs to keep winning if it wants an invitation to the big dance. Otherwise, the Tigers will find themselves in the NIT. "If we get that kind of production out of our post guys with the way our perimeter players play, it makes us a pretty good ballclub," Haith said.